Wal-Mart is coming to Suburban Plaza in Decatur. In a move many months, if not years, in the making, Selig Enterprises will finally re-develop Suburban Plaza and Wal-Mart will be the biggest addition. Pep Boys, Eckerd and Winn-Dixie/Save Rite have all closed at the center over the years and few tenants other than Suburban Lanes, Suburban Custom Awards & Framing and Big Lots have remained open. Last Chance Thrift shop, once located in a nearby former Kroger, opened in 2009 in the former Pep Boys in the center. From sketches I've seen, their space, as well as the neighboring shuttered Eckerd will both be demolished to make way for the coming Wal-Mart. While nothing is confirmed, sources indicate that Suburban Lanes, located below the current center and possibly the oldest tenant, dating back to 1954, will remain open although its configuration may change slightly. Suburban Custom Awards & Framing, which dates back to 1964, will supposedly be present in the new center although when I spoke with an associate there, they, like all others I spoke with in the Suburban Plaza, were unaware a Wal-Mart was coming. My friends at DecaturMetro, the Asian Cajuns, and countless others will surely be glad something is finally being done with the center, but likely disappointed that the new development is coming in the form of big box behemoth Wal-Mart and not something along the lines of the long rumored and sought after Trader Joe's. While at one point, there were talks with Trader Joe's to open in the center, currently there is nothing in the works. There is however a Facebook group aimed at convincing Trader Joe's to open in Decatur, with Suburban Plaza one of the most frequently suggested locations. Just four miles away, at the intersection of Columbia Drive and Memorial Drive, Wal-Mart opened a Supercenter store on the site of the former Avondale / Columbia Mall in March 2008. Clearly, Wal-Mart believes the proximity is not an issue. Personally, I tend to agree, given the relatively different demographics of the respective neighborhoods. Selig Enterprises provides this graph detailing the demographics of the Suburban Plaza neighborhoods. Given Suburban Plaza's proximity to Emory as well as Agnes Scott, it presents a unique opportunity for Wal-Mart to expand its presence inside the perimeter and sell to the coveted college crowd. Over on North Druid Hills Road, Rich's former discount department store Richway became a Target store in the 1990s and in the early 2000s was demolished to become a new test store for "Target Greatland." Bigger than a normal Target, but not to the level or variety of a Super Target, the concept never took off and has since been abandoned, though for now the "Greatland" branding remains. This Target has thrived on supplying generations of Emory students and will surely be impacted when the Wal-Mart opens. Selig previously worked with Wal-Mart is helping them open their first intown location at The District at Howell Mill. Originally meant for The Home Depot, Selig approached Wal-Mart when THD fell through and the center opened in late 2006. 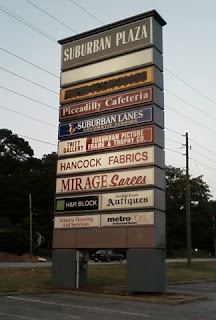 Currently, Suburban Plaza has a fair amount of vacancy with the once relocated Winn-Dixie that gave way to the short lived Save Rite, and even shorter lived Super Giant Foods (and a Piggly Wiggly that never opened), sitting idle as well as numerous other smaller spaces. Interestingly, a former 1970s Pizza Hut closed and became "Cozy Burger Town" and Pizza Hut relocated to a much smaller space at the corner of Church and North Decatur Roads. Though not a Selig project, another intown Wal-Mart will open next year in Atlanta's historic Westside Village. Originally announced this past December, Wal-Mart will construct an 80,000 s/f location on Martin Luther King Jr. Dr., replacing a 28,000 s/f Publix Supermarket. While larger than the Publix, 80,000 s/f is far from your typical Wal-Mart and is part of a company initiative to experiment with smaller format stores. Recently the company filed building permits with the city and anticipates opening late in the first half of 2012. Expect the Suburban Plaza Wal-Mart to be a welcome addition for Emory and Agnes Scott students and for some neighbors as well. Attending ICSC's REcon last month in Las Vegas, A Selig representative told me the store should be open by early to mid 2013. I am ambivalent about this. I don't live far from here and every Sunday morning drive past this sad scene on my way to DeKalb Framers Market. It will be nice to see something going in, but I hate Wal-Mart as a shopping experience and don't like the impact this will have on the nearby area. I'll continue to shop at Target. Not sure what is meant by the Greatland concept being abandoned. Have all of the others (which existed long before this one was converted) closed or been rebranded? The only major retail branding shift Target has made over the last decade or so was to abandon the Archer Farms Market name for the grocery side of SuperTarget (though the product brand continues on the shelves inside). As for whether this the right fit for an area bordering Decatur: apparently so. I don't know why people shop at WM, except apparently they think they can't do any better. They perceive prices to be lower, selection to be greater, etc. I will admit that the hours of operation encourage people to shop there. And yes, WM is a classier operation than it used to be. I've spent an incredible amount of time in those stores in the last year doing audits, mystery shops, and so forth, and I must say: it looks better but still feels like WM. I see people I'd never expect to see in the Howell Mill location, but that doesn't make it seem less depressing, smell better, etc. People must be shopping there out of perceived convenience or other factors, because it sure isn't what I imagine most people describing as "fun." There are already folks in Decatur and environs that think they "must" go to WM for various reasons, and that number will only likely increase with the addition of a closer location. Thanks much for providing the detailed news on this! I spoke with Target's Director of Real Estate last month at ICSC's REcon convention in Vegas and she informed me the "Greatland" concept is no longer a current store format. Basically, no future stores will be built with the Greatland branding and existing stores will remain for now but may in the [near] future be reconfigured /rebranded. Carl-your attitude is what is wrong with so many people that live in Decatur. What a snob you are the way you talk about THOSE people. That shopping center has been in need of an overhaul for years!! It is a pit now, I'm sorry. Even though I'm not crazy about Wal-Mart, either, it is better than what is there now. Evidently other businesses aren't interested. I'm under the impression that some other businesses were interested, but that the owner of suburban plaza was holding out for a big box store to revamp the place. If he couldn't get a big box store then he'd only rent to short term renters like what is there now. I hate that the place has sat empty for so long, but I'm not jazzed. I've shopped at Walmart at times and it's honestly not that great. It's a monstrosity and the prices are really no lower than other places. Why can't we have smaller, better stores, that won't overwhelm everything around them? Target Greatland was just Super Target without the food. There used to be one at Sawgrass Mills in Sunrise, FL; They have since converted it to a Super Target. And with Target's current initiative to add groceries to regular Target stores, Greatland no longer made sense. Good, this means more business for the awesome Cozy Burger Town. That place is tasty! And they better keep Last Chance Thrift Store there, still plenty of room even if they do a whole center remodel. You are correct, my apologies. The correction has been made. Hate that it is not a Trader Joe's coming and hope that Last Chance stays! Those folks on the Decatur Metro blog are livid about this development. It has to be better than a rotting expanse of washed out asphalt and shuttered storefronts. I own That Pottery Place studio in Suburban Plaza and I find it interestng that the leasing company, Selig Enterprises, has said nothing to us about this. No other tenant seems to know either except by rumor and now some seeming confirmation. I hope we can stay in Suburban and don't get forced out or priced out given this development. We've just now started to settle into this new location for us (since October 2009)and Decatur is our home as well. I am all for this development being remodeled because I hate driving by it every day. However, obviously some of the Wal-mart supporters on here do not live in the Medlock area. We already get enough Emory cut-through traffic, now we will have even more traffic from a Wal-mart! I am sure that there are other "nice" looking stores that could go in and make life so much better in this area. Even though a Trader Joes would bring more traffic, at least it is a nicer establishment. I live across the street on Church Street. CRAP!!!! I am putting my house on the market and getting out of here before this happens!!! I am not happy!!! We DO NOT NEED a Walmart in Decatur!!!!!!!! Should anyone in Decatur, or elsewhere ITP for that matter, like me to forward the weekly Zone 2 (where the intown, Howell Station Wal-Mart is located) crime stats I'll be glad to add them to my distribution list. Then you too can see, firsthand, just how much criminal activity a Wal-Mart attracts. On a daily basis! This is so sad. Decatur is not a place for a Walmart. I live less than a half a mile from here and I know at least 20 families that would protest this. Decatur is a place where local mom and pop type stores are embraced. To me opening a walmart here is a travesty. I hoped this plaza would get revitalized but I hoped if it would be a big box store or a chain that it would be a trader joes, fresh market or even a whole foods. I will NOT shop at walmart and I believe that neither will the locals. yea. wal-mart is the antichrist, but suburban lanes is the savior. nothing brings more joy than rollin a big ball down a slicked up lane and crashin it into a buncha pins. and sundays, 6 bucks, all you can bowl. that's a better deal than you'll EVER get at wal-mart. just don't close the lanes, ya'll. just don't close the lanes. We need a establishment like Trader Joes. Walmart breeds and promotes continual disregard to community in the name of profit. Where does this end? This is a festering cancer that has to end. Give us an cultural environment, not a shanty!